Is Peanut Butter The Best Present For Malnourished Teen Moms-To-Be? : Goats and Soda Pregnant teenagers in Malawi may not get enough to eat — with dire consequences for their baby. Peanut butter could help, but the girls need to be convinced not to share it with family members. 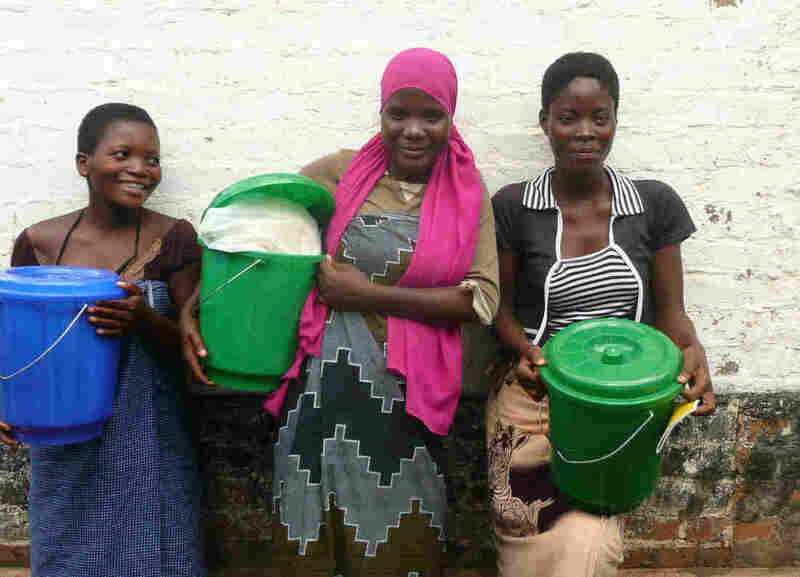 Three women in Malawi hold buckets of a fortified corn soy blend. Is this the right food for pregnant teens? Or is nutrition-rich peanut butter better? Pregnant mothers are often reminded that they're eating for two. But 17-year-old Gladys barely has enough food for one. Gladys, who is pregnant with her first child, lives in Malawi, a country with widespread poverty and malnutrition. In 2012, 78 out of every 1,000 children died before they turned 5, according to UNICEF. Nearly half of all children are stunted. That means their height is below the fifth percentile for their age, and they are prone to chronic diseases and tend to struggle in school. Time for a peanut butter break. Now one pediatrician is tackling the problem by focusing not just on the children but young mothers like Gladys. And he's using peanut butter as his tool. The problem is malnutrition often starts in the womb. "A third of stunting occurs before birth and there's nothing you can do once the child is born," says Dr. Mark Manary, a pediatrician at Washington University in St. Louis and the founder of Project Peanut Butter. His Malawi-based organization uses a locally produced, high-calorie, nutrient-rich peanut butter called chiponde to treat malnourished children in Malawi, Sierra Leone and Ghana. It's one of many therapeutic foods aid agencies used to treat severe malnutrition. In Manary's latest study, called Mamachiponde, the researchers have formulated a special peanut paste just for pregnant teens. It has vitamins, whey protein and nonfat dry milk mixed in. And they're testing how effective it is is in helping pregnant adolescents in southern Malawi deliver a healthy baby. An estimated 1 in 36 women in the country dies from pregnancy complications. Young teenagers are the most vulnerable. "Many are still girls," he says. "The body hasn't had correct nutrition to develop completely." Since last spring, Manary and his team have worked with 15 clinics in Malawi to enroll pregnant women, 16 and up, whose mid-upper arm circumference (MUAC) is less than 23 centimeters, or 9 inches — a sign of malnutrition. The mothers-to-be are given a two-week supply of one of three treatments. One group gets corn soy blend fortified with folic acid and iron pills, the Malawi standard supplement for pregnant women. Another gets the corn blend plus prenatal vitamins. The third group receives the special peanut paste, which has twice the recommended intake of proteins, vitamins and other nutrients. When the mothers run out of the food, they return to the clinic for another two-week supply. They keep getting treatment until their arm circumference is more than 23 centimeters. The team then monitors the mother and the baby until the child is 3 months old. Ideally, the mother would deliver a baby heavier than 5.5 pounds — the World Health Organization cutoff for low birth weight. But Dr. Peggy Papathakis, the study's director on ground, says she'd like to see a newborn be at least 3,000 grams, or 6.6 pounds. In late April, Gladys, the 17-year-old, gave birth to her first child. The baby girl clocked in at 5.7 pounds after having been part of the study for roughly a month. The mother reported that she ate all the food she'd been given, but Papathakis remains doubtful. Gladys lives in a small home with her husband, mother and seven younger siblings. "Ideally our foods are for the pregnant woman," says Papathakis, a nutritionist from California Polytechnic State University. "But you can imagine, there is no way she is going to keep that for herself." So nurses often coach the pregnant young mothers on how to explain to their families that the food is important for the mother and the baby. More than 1,000 women and teens have been enrolled in the study, and researchers expect to test a total of 2,000 girls by 2016, with the help of a $50,000 grant from The Sackler Institute for Nutrition Science. It explores a field that hasn't been studied enough, says Mireille Mclean, the institute's associate director and one of the judges. "Right now we consider that an adolescent pregnant woman has the same needs as an adult woman, but it's probably not true," Mclean says. She hopes the study will help generate nutritional guidelines that are geared toward teen mothers. The Mamachiponde study is a good start to a complex issue, says Dr. David Sanders, a pediatrician at the University of the Western Cape in South Africa, who isn't involved in the study. But he says that the key to helping young women in Malawi is preventing unwanted pregnancy. Sanders applauds Manary for producing the chiponde in Malawi -- that's good for the economy — rather than flying in therapeutic food from outside. "You have to in the long run improve people's livelihoods," he says. "We can do that in part by ensuring that these kind of interventions stimulate local productivity and put more money in the pockets of poor peasants." Sanders also warns against turning a food problem into a medical one by making people think they are getting medicine. It's more helpful, he says, to clearly tell the mother that their children are eating peanuts. That way the mothers will know that the key to stopping malnutrition isn't some mysterious medicine but something that they can get locally and add into their diets. For now, Papathakis says she's happy to just be helping a group of women too often neglected: "You don't get a healthy infant unless you have a healthy mother."